Despite the presence of several manufacturers of a variety of architectural coatings across the globe, international giants such as The Sherwin-Williams Company, PPG Industries Inc., and Akzo Nobel command dominance owing to their vast portfolios and well-established marketing networks across the globe, observes Transparency Market Research in a recent report. Apart from a clear focus on research and development activities with the view of advancing in highly promising market segments such as water-based products and the residential construction segment in emerging economies, these companies are also cashing in consolidation opportunities to strengthen their positions. In the next few years, while the number of new companies is expected to rise in the market, which are most likely to focus on developments in the field of water-based products, the intensity of competition is expected to soar. Nevertheless, emerging economies will provide promising growth opportunities as the rising population of affluent middle-class people increasingly invests in renovation activities. According to the report, the global architectural coatings market was valued at US$53,264.4 mn in 2016. The market is estimated to reach US$87,500.4 mn by 2025, expanding at a CAGR of 5.7% between 2017 and 2025. In terms of market share as well as growth potential, Asia Pacific dominated the global architectural coatings market in 2016, contributing a significant market share of revenue. In the next few years as well, Asia Pacific is likely to remain an attractive market for architectural coatings owing to the rising demand for attractive furniture and maintenance and repair of the same. 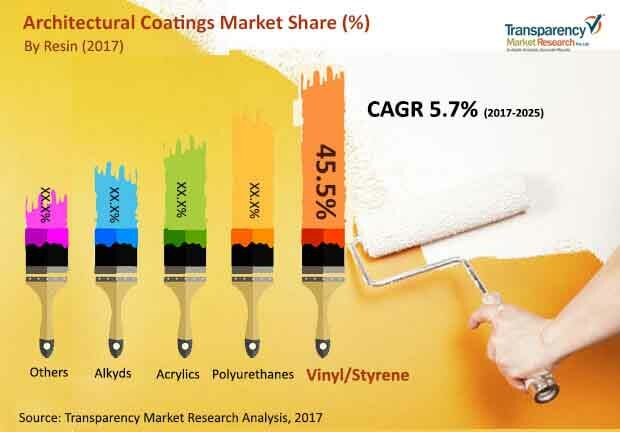 Of the key varieties of resins used to manufacture architectural coatings, the consumption of alkyd is declining because of several VOC regulations imposed across a number of countries coupled with the availability of alternate coatings. Solvent-based alkyds are being rapidly replaced with water-based emulsions owing to their low odor and low threat of volatile organic compounds. Demand for architectural coatings is primarily driven by the rising requirement for new buildings in the non-residential sector and renovation activities across the globe. Furthermore, the rising need for sustainable products in interior applications and the increased demand for low-odor and higher durability coatings is boosting the demand for architectural coatings with low VOC emissions. Growth in the architectural coatings market is also expected to be fuelled by the increasing number of new housing construction. Growth will be supported by increase in the residential maintenance activities, which usually involve recoating existing structures. Increasing public awareness regarding coatings with low volatile organic compounds and the implementation of safety regulations are factors that significantly contribute to the growth of the architectural coatings market. Increasing disposable incomes in emerging economies are also expected to add to the global demand for architectural coatings in the next few years.